However, I like to prepare my beef ribs entirely in the smoker. So I don’t ever boil them. I want the full, smoked flavor of ribs cooked entirely in the smoker. As I found out, it isn’t easy to replicate Black’s style of beef rib preparation. However, with some research and multiple smoking sessions, I finally got it right. 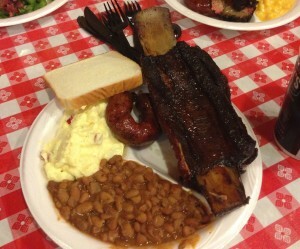 I believe that the beef ribs you find at most barbecue restaurants are not as good as pork ribs for two reasons. Most often, they have been boiled (stewed) after a light grilling or smoking. This type of beef ribs may be moist, but they don’t taste like barbecue to me. And, of course, they won’t show a smoke ring in the meat. If the ribs are prepared entirely in a smoker, they frequently haven’t been smoked long enough at a low enough temperature. These ribs turn out tough and chewy, often with a burned crust. Of course, some beef rib fans actually like a little “bark” on their beef ribs, similar to the bark on the burnt ends of brisket. So, tastes vary. In order to cook great ribs using only your smoker, you need three things — a long smoking time at a low temperature, a high finishing temperature (compared to many other smoked meats), and a humid environment in your smoker. In this article, I’ll give the basic information on how to do this. 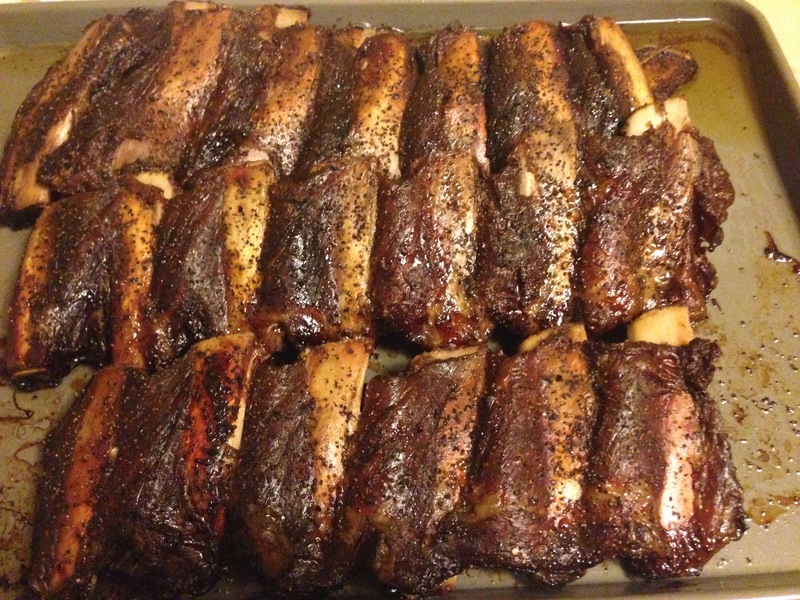 Tomorrow, I will post my recipe for beef ribs and the exact details of how I do it on my home smoker (a Weber bullet smoker). I’ll also explain how to do it on a charcoal grill, which I’ve also done. My smoked beef short ribs. You can’t rush beef ribs. They’re like brisket that way. They need to undergo a long smoking session, around 8 hours, at a low temperature — the 220–230 °F (104–110 °C) range has worked best for me. Shorter times and higher temperatures result in tough ribs, often with a hard crust. In one of my early smoking sessions, my smoker was running too hot (around 275 °F/135 °C) and I pulled the ribs off after 6 hours. They were edible, but not the style of rib I was looking for. For that, you really do need to employ the low and slow approach. A big part of the requirement for a long, low temperature smoke is that beef ribs, like brisket, contain a lot of connective tissue (including collagen). They also contain a fair amount of fat. The long, slow cook eventually melts this collagen and renders the fat so that the meat becomes tender. 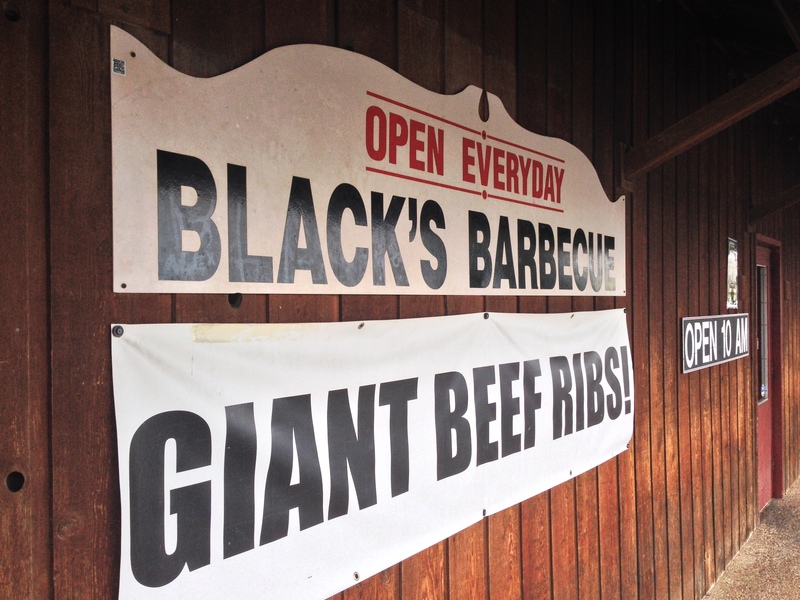 (The same thing occurs in brisket.) In order to complete the job of tenderizing the meat, you need to finish at an internal temperature of at least 200 °F (93 °C). 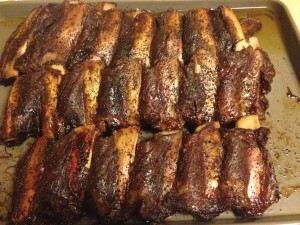 A lot of smoked meats (pork ribs, chicken) are pulled off the smoker at much lower temperatures, but beef ribs require the finishing temperature to be higher or they will be chewy. Near the end of the smoke, bumping up your smoker temperature slightly can help you wrap things up. A long cooking session means the meat has plenty of time to lose moisture. For this reason, I always smoke beef ribs with a water pan and avoid opening the smoker, unless absolutely necessary, until I know I am just about finished. A water pan really does keep the environment in the cooler humid. If you stick a metal probe thermometer into a vent to double check the temperature, you will see small water droplets condense on it. I don’t like to open the smoker during the cooking session, so I have started taking a spray bottle of water and simply spraying a mist of water into the top vents on the smoker twice every 20 minutes or so. Combined with the water pan in the smoker, this keeps even the outside of the ribs from drying out. Another thing many people do is smoke their ribs for awhile, then pull them off the smoker, wrap them in aluminum foil, and finish cooking the ribs — either in an oven or in the smoker. The foil keeps the remaining moisture from escaping as the cook progresses. Although this works, I like the flavor of the meat better when the smoke permeates it, so I don’t wrap my ribs. The second part of this article explains how I do this on my home smoker. This sounds good. Is there a maximum amount of smoke penetration you can achieve? You might want to experiment. The pros at Dinosaur Barbeque, experts from, surprise, Syracuse, New York, recommend 3 hours for brisket and 4-5 hours for a pork shoulder. They say about 3/8 inch of smoke ring is maximum. I’d be curious to compare your ribs, one batch smoked for 3 hours, then wrapped in foil until done, and another batch cooked with your usual technique. I think I’ll try it as soon as I can dig my smoker out of the snow. I’m not sure if there is a maximum amount of smoke penetration, but you certainly can make barbecue that is too smoky. I use a charcoal smoker (Weber) and add the hardwood as chunks soaked in water. I usually add 1 fist-sized chunk per every two hours and that gives me the level of smoke I desire. Well, I guess the only way to find out is an experiment. I think I’ll cook two racks on separate grills one with full 8 hour smoke and one with 4 hour smoke and foil and let you know how it goes. Cool! Give me all the details when you do this.